To launch Gnome Schedule, run the gnome-schedule command in the terminal. To create a new task, press the New button in the main toolbar. Select the type of task you want to create. Most often, you would want to create a recurrent task that runs at predefined intervals. To create a scheduled task, select the Recurrent task option, give the new task a descriptive name, and specify the command or script you want the task to perform. By default, the utility displays the output of the command or the script in a separate terminal window, but you can disable this feature by selecting the Suppress output option. Use then the options available in the Time & Date section to specify the desired schedule. If you plan to add multiple jobs with similar settings, you can save the created task as a template. This way, you don't have to create every single task from scratch. To check whether the added task works as it's supposed to, use the Run selected task button. You can also use this to run the task at any time. That's pretty much all there is to it. 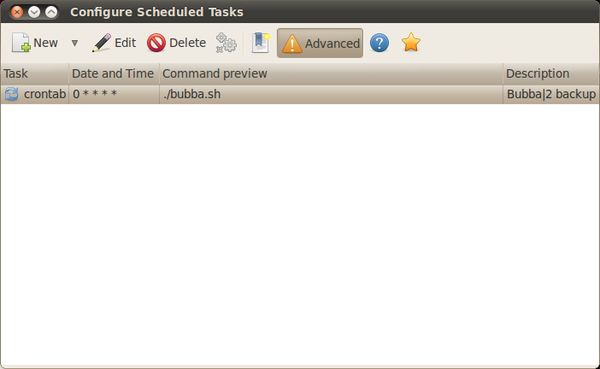 Gnome Schedule is not overloaded with features, but it makes it supremely easy to add and configure scheduled tasks.